The Powerhorse® Skid Steer Horizontal/Vertical Log Splitter attaches to skid steers with an industry-standard SAE J2513 quick-attach mount plate and uses the skid steer's hydraulics to operate a 4in. x 24in. cylinder. 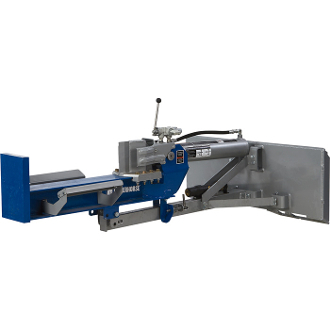 User-friendly design lets you quickly switch between horizontal and vertical splitting, so you never have to lift larger logs. Heavy-duty design with industrial I-beam construction and thick steel support brackets to stand up to the toughest conditions. Auto-return wedge saves time. Log cradles catch logs as they are split. 22 tons of splitting force at max. pressure, 3000 PSI. U.S.A.-made Brand control valve. Adjustable height to ensure comfortable working conditions. Some assembly required.